A childlike janitor wins the Mayor For A Day contest intended for kids only and begins to have more influence over the press than the Mayor himself, who isn't particularly favored by the press. Good casting makes this show enjoyable. In this episode, the staff is expecting a student from a local elementary school to be the honorary Mayor-for-a-day kid. It does not go as plan when the winner of the essay turns out to be a janitor from one of the schools. 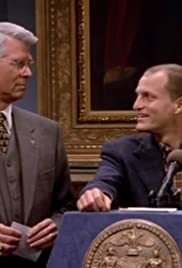 Instead of a kid they have a forty something year old, Tommy Dugan (Woody Harrelson), to introduce at the press conference. But to everyone surprise Tommy is a likable guy with a simple and honest approach to life and politics. But when the press starts going to Tommy instead of Mayor Winston for comments, the Mayor is not too happy. This was an enjoyable episode that had lots of humorous lines which always makes for a fine watch. Woody Harrelson does a great job as the winning janitor and makes the viewer feel for the character. Great acting throughout the show. Good watch.